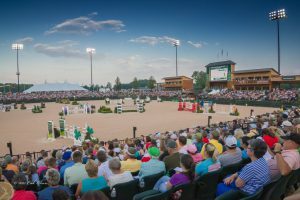 Unless you are a horse lover, you may not have heard of The Tryon International Equestrian Center. 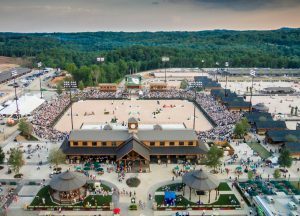 Located in Mill Spring on highway 74 about 30 minutes west of Shelby, TIEQ is a premiere Equestrian Lifestyle Destination showcasing some of the top riders in the Hunter/Jumper, Dressage, and Eventing disciplines. Coming back from a recent trip to Tennessee, we stopped in recently, and were really surprised at how large the complex is. I was fortunate enough to speak with Sharon Decker, Coo and VP about the center, and wanted to find out more. GA: Sharon, what is the purpose of TIEQ? Sharon: To make equestrian sports more accessible to everyone, and to grow the sport. GA: Who owns the facility? GA: So who attends your events? Sharon: Competitors of course, but also horse owners and their family and friends…and people who just love horses. GA: So what kind of events do you have? Sharon: Olympic level hunter jumper, dressage, saddle bred, and soon to offer western eventsreining, barrel racing, cutting horses, etc. We also offer specialty events, such as Gladiator Polo. GA: I understand that several college equestrian teams practice here? Sharon: Yes we have several collegiate teams that train here, including Clemson, University of South Carolina, University of Georgia, among others. GA: So what do you have to offer for families with children? rides, magicians, mini-golf, and face painting. I would mention that our Pony Club events for children have proven to be wildly popular.-check it out, it’s a hoot! GA: So what if we want to make a day or a weekend out of our trip? Sharon: We have six restaurants on site, four are year round. We have one bedroom tiny houses for rent, a fifty room hotel, as well as luxury homes for rent on the property. We also have lots of specialty shops, as well as a general store with a deli, snacks, gifts, etc. GA: I understand you have a really big event coming up in September? Sharon: We do! September 11-23rd we are thrilled to host The FEI World Equestrian Games™. They are held every four years in the middle of the Olympic cycle, and are one of the biggest events on the global sporting calendar combining eight equestrian World Championship caliber events.